D3/HDN Detectable Needles™ significantly help to eradicate issues of broken needles, a major concern in the meat production industry. Some meat processors or production companies already insist on the use of detectable needles. Made by Ideal Instruments, D3/HDN Detectable Needles™ are the needles of choice for farmers involved in the meat production industry. 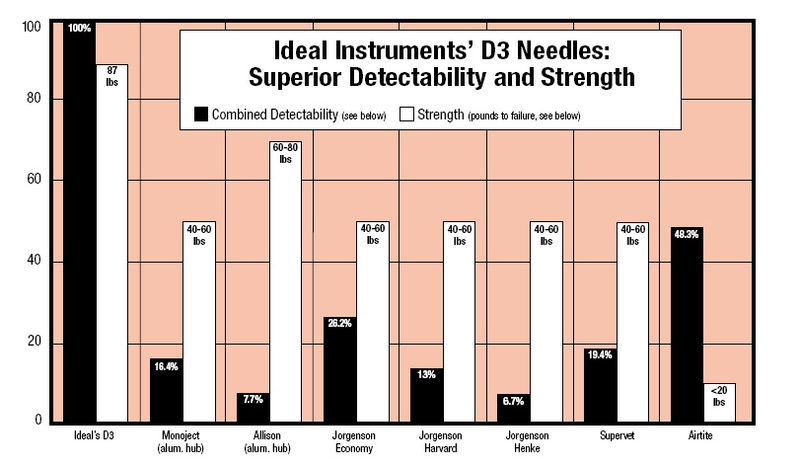 D3/HDN Detectable Needles™ are not only very strong and unlikely to break, but above all they are detectable by metal detection systems in the processing line. Thanks to D3/HDN Detectable Needles™ agricultural businesses can be guaranteed of high quality standards with regards to the needles in use on the farm.